Introduction: the validity of the ratio arterial oxygen saturation and inspiratory oxygen fraction (SaO /FiO2), calculated by pulse oximetry and by arterial gases in patients with exacerbation of chronic obstructive pulmonary disease (E-COPD) at the altitude of Bogotá are not known. Patients with COPD can present alterations in gas exchange that can worsen with bronchospasm episodes. Obtaining values of SaO2 by oximetry and FiO2 can provide valuable information on the course of the exacerbation. Objective: to determine the validity of the SaO2/ iO2 ratio calculated by pulse oximetry and by arterial gases in relation to mechanical ventilation (VM) outcomes and mortality at seven and 30 days. 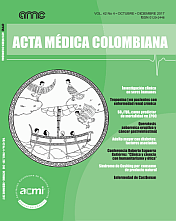 Methods: a prospective cohort study with diagnostic test analysis was performed, calculating DECAF, BAP-65, CURB-65, arterial blood gas and pulse oximetry scores on admission of patients with E-COPD, and the outcome of mortality was evaluated at seven and 30 days of admission and the MV requirement during hospitalization; the SaO2/FiO2 ratio was calculated using the SaO2 obtained in the arterial gases and independently the SaO2/FiO2 ratio with the SaO2 obtained by pulse oximetry. With the data obtained, the values of sensitivity (S), specificity (E), positive predictive value (VPP), negative predictive value (NPV), positive likelihood ratio (LR +), negative likelihood ratio (LR-) and low area the operating characteristics curve of the receiver (ACOR) were calculated. Results: 462 E-COPD were analyzed; the MV requirement was 14.3% and 30-day mortality of 5.71%, the sensitivity of the SaO2/FiO2 ratio calculated by pulse oximetry for MV outcome was 84.6% (95% CI : 75-94.2), specificity 42% (95% CI: 37-47), PPV: 19.6% (95% CI: 14.8-24.4), NPV: 94.3% (95% CI: 90.5-98), LR +: 1.46 (95% CI : 1.28-1.67), LR: 0.37 (95% CI: 0.20-1.67), ACOR: 0.779% (95% CI: 0.711-0.847) p <0.0001, sensitivity of SaO2/FiO2 ratio for arterial blood gases for MV was 83% (95% CI: 73.2-92.9), specificity 57% (95% CI: 51.9-62.2), PPV: 24.8% (95% CI: 18.8-30.7), NPV: 95.2% (95% CI: 92.2-98.2), LR +: 1.94 (IC95%: 1.65-2.27), LR-: 0.30 (IC95%: 0.17-0.51), ACOR: 0.799% (IC95%: 0.737-0.861) p <0.0001, the sensitivity of the SaO2/FiO2 ratio by oximetry for outcome of mortality has a sensitivity of 76.8% (95% CI: 58.8- 95), specificity of 39.2% (95% CI: 34.4-43.9), PPV: 7.1% (95% CI: 3.9-10.3), NPV: 96.5% (95% CI : 93.5-99.5), LR +: 1.26 (IC95%: 1.01-1.58), LR-: 0.59 (CI 95%: 0.29-1.20), ACOR: 0.689% (IC95%: 0.568-0.810) p <0.0001, the sensitivity of the SaO2/FiO2 ratio for arterial blood gases was 80.8% (95% CI: 63.7-97.8), specificity 53.2% (95% CI: 48.3-58), PPV: 9.6% (95% CI: 5.5-13.8), NPV: 97.8% (95% CI: 95.7-99.9), LR +: 1.73 (95% CI: 1.39-2.14), LR-: 0.36 (IC95%: 0.16-0.80), ACOR: 0.732% (IC95%: 0.617-0.846) p <0.0001.